Add weed to your liquide of choice. Something with high fat will work best. Whole milk, half & half, or cream. Swish around and cover. Bring to a boil, then simmer it for about 45 mins. While you’re waiting, add the cocoa powder and sugar to your mug. If you want your hot cocoa to be chocolatier or sweeter, just add more cocoa powder or sugar. Stir it up. Add vanilla. After the liquide has simmered, strain to get the bits of marijuana out. Pour the milk into your cocoa mixture. You may need to add more milk, because some of it will evaporate. That’s OK! 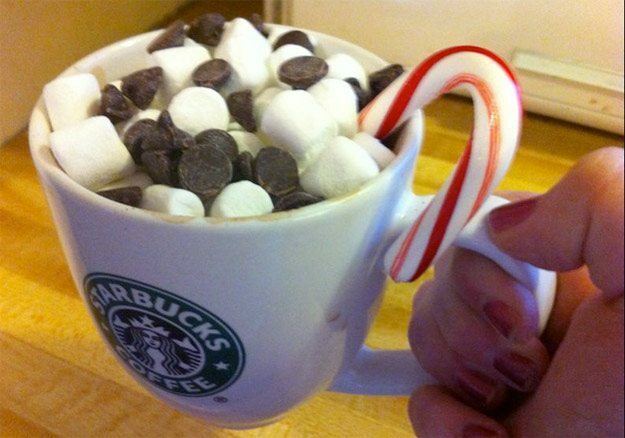 Top with marshmallows, more chocolate, and a candy cane. *When adding the marijuana, take your personal tolerance level into consideration. I have a low tolerance level and 1 tbsp got me to a  for about 5 hours. And as with all edibles, give it time to kick in before making more!